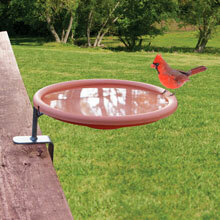 A perfect addition for a bird lover's patio, porch or deck. 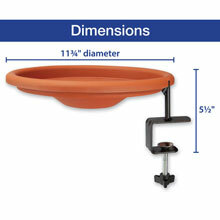 This unique birdbath features an adjustable clamp that fits railings up to 2 inches thick. 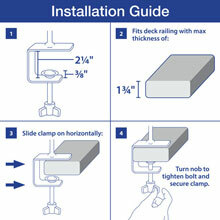 Easy no tools instillation. 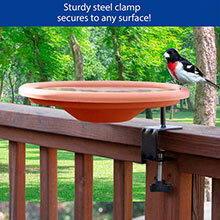 Simply attach the clamp to your deck and tighten it to form a strong and secure mount for your bird bath. 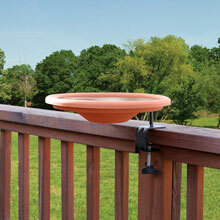 The bowl detaches from the steel ring for easy cleanup. 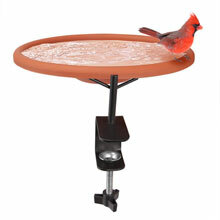 •PRACTICAL DESIGN: Enjoy the beauty of nature without needing binoculars, this bird bath is designed to attract the birds right to your porch or patio, you can study and appreciate the different bird species from the comfort of your home, while they flock to this unique birdbath for drinking and bathing. •DURABLE MATERIALS: Heavy duty iron clamp with a turn screw clamp for secure mounting, black powder coat for a rust free finish. 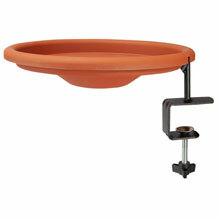 The plastic terra cotta colored bowl is removable for easy cleaning and holds one quart of water. 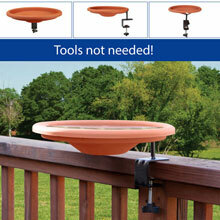 •EASY INSTILLATION AND CLEANING: This versatile bird bath feature a unique adjustable screw clamp, no tool required for set up, simply place on any deck or porch railing up to 2 inches thick and tighten the screw for a secure stable bracket. 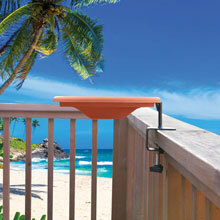 The bowl snaps out of the base for easy cleaning without having to remove the bracket. •PROVIDES HOURS OF ENTERTAINMENT: Closely watch beautiful songbirds, attract a wide variety of birds including finches, juncos, chickadees, nuthatches, titmice, cardinals, sparrows, jays, cardinals and more. 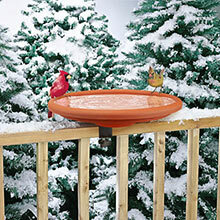 The removable tray is designed to hold one quart of water but also is shallow enough that bird will enjoy bathing and drinking from it. •GREAT GIFT FOR: Bird watchers, house warming, gardeners, students, elderly, children, nature lovers or yourself. 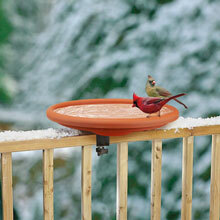 It will definitely become a favorite gift that brings nature right onto your patio, porch or deck.